From the Panama Papers to Watergate to environmental issues, investigative journalist figures – known as the “special forces” in the reporting world – help unravel hidden illegal occurrences for to the public. One of the biggest important issue that has caught the attention of investigative journalists in the U.S. and Indonesia alike is “sea slavery”, or human trafficking at sea. Investigative journalists’ reporting has led to the rescue and return home of sea slaves by exposing the inhumane treatment that they endure. Indonesia, with maritime concerns as one of its key country priorities and fisheries as a key income-generating activity, has had its fishermen routinely trafficked. The Government of Indonesia recently has also increasingly put special attention on enforcing the law against human trafficking at sea and illegal fishing. In the United States, with more than $34 billion imported seafood goods, consumers increasingly wish to be aware of the issues related to the food they purchase. Investigative journalism helps to increase their awareness, potentially leading to beneficial outcomes for all parties. As demonstrated with similar issues in other countries, the best outcome is when the exposure, rather than causing a lasting economic hit on industry, leads to action to eliminate the practices in a verifiable way, after which the industry and exports can grow even more than before – a “win-win”. 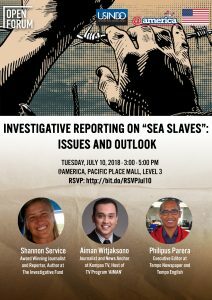 In this panel, investigative journalists from U.S. and Indonesia will answer questions such as: how can U.S. and Indonesia investigative journalism play a key role in combatting sea slavery and lead to beneficial outcomes? What are the challenges in doing investigative journalism? What is the future of investigative journalism in the U.S. and Indonesia? How could the array of stakeholders in the U.S. and Indonesia collaborate to curtail or virtually eliminate sea slavery, maintain the growth of the Indonesian fishing industry, enhance cross-border cooperation, and strengthen investigative journalism? The United States-Indonesia Society (USINDO), in cooperation with the U.S. Embassy Jakarta and @america is delighted to host Ms. Shannon Service, Award Winning Journalist and Reporter, Author at The Investigative Fund; Mr. Aiman Witjaksono, Journalist and News Anchor at Kompas TV; and Mr. Philipus Parera, Executive Editor of Tempo Newspaper and Tempo English. Please join us for an engaging discussion. To register, please kindly RSVP HERE, or email to usindojkt@usindo.org no later than Tuesday, July 10 at 12.00 PM to attend this Open Forum. Shannon Service has nearly ten years of experience on projects for HBO, PBS, and FSTV. She’s reported from Iraq, Palestine, and Israel, hosted multiple national television programs and launched a mobile-based reporting project for YouTube. Her articles and videos can be found online at the Bay Citizen, The New York Times, Utne Reader, and PBS’s Need To Know and she recently co-produced a two-part radio series for Morning Edition. Shannon is recently co-leading an investigative project in Southeast Asia on how fisherman are routinely trafficked. She holds a Master’s in Journalism from UC Berkeley and recently won the Knight Award for Best Environmental and Science Reporting. Aiman Witjaksono is a journalist and news anchor at Kompas TV. Aiman is the host of a TV program ‘AIMAN’, which discusses and unravels the mysteries of the latest issues in society. In 2014 and 2017, he won the Best Presenter Talkshow award from the Indonesian Broadcasting Commission Award (KPI) and in 2015 won the Elizabeth O’Neill Journalism Award by the Australian Department of Foreign Affairs. Philipus Parera is the Executive Editor of Koran Tempo and Tempo English. Previously, Philipus is the Managing Editor of Tempo’s Investigative Desk. He has been involved in various investigations, including Panama Papers. He holds a Master’s in International Communication from University of Leeds and Bachelor’s in Communication from Universitas Atma Jaya Yogyakarta.